The 200 g canister is the best value for baking and using in your coffee and tea. 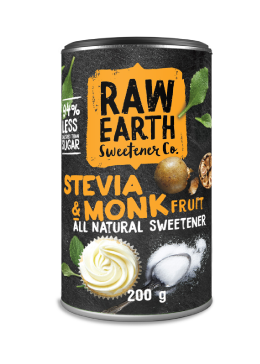 With 94% less calories than sugar, the Raw Earth canister is the perfect size for baking, or sweetening your coffee, tea and smoothies. Enjoy the natural sweetness in your delicious desserts, breakfast pancakes and other sweet treats. Bringing you the best sweet taste experience. The 40 sticks pack is perfect for the coffee and tea lovers, with 94% less calories than sugar. Use in your coffee and tea to have the sweet taste you love. Can also be used to sprinkle on your porridge, smoothies and other delicious treats. 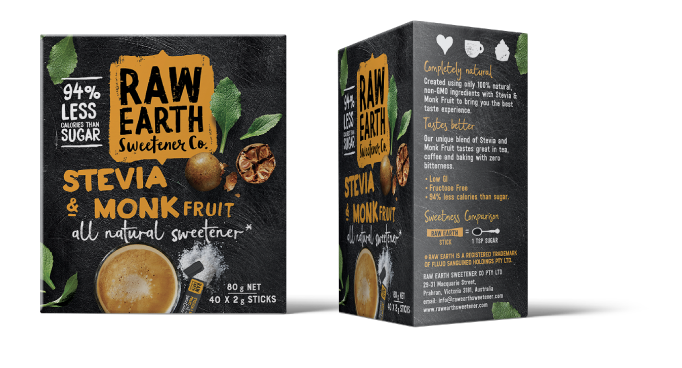 Each 2g Raw Earth stick contains 0.5 calories compared to a sugar worth 16 calories.